Americans love chicken and healthy chicken recipes. Chicken is nutritionally a lean protein that is quick cooking, reliable, and affordable. Chicken breasts in particular are a must buy for busy families. Chicken breasts can prove to be the healthiest choices if they are cooked with some healthy ingredients. So, If you are craving for some sizzling yet healthy chicken breasts recipes, give any of these 3 sizzling magazine recipes a go! The lemon slices intensify the flavor of chicken and create a gorgeous look for this delicious chicken recipe; it adds incredible depth to the sauce. Wipe pan with paper towels. Heat pan over medium heat. Add 1 1/2 teaspoons butter to pan; swirl until butter melts. Add shallot, 1/2 teaspoon grated garlic, oregano sprig, and thyme sprig; cook 1 minute. Add wine to pan, scraping pan to loosen browned bits. Bring to a boil; cook 3 minutes or until liquid almost evaporates. Add remaining 1/8 teaspoon salt, stock, and flour to pan, stirring with a whisk. Bring to a boil; reduce heat, and simmer 3 minutes or until liquid is reduced to about 2/3 cup. Remove pan from heat; discard oregano and thyme sprigs. Stir in remaining 1 1/2 tablespoons butter and capers, stirring until butter melts. Return chicken and any juices to pan; turn to coat with sauce. Top chicken with lemon mixture. Sprinkle with parsley. chicken breasts should not be marinated for hours. 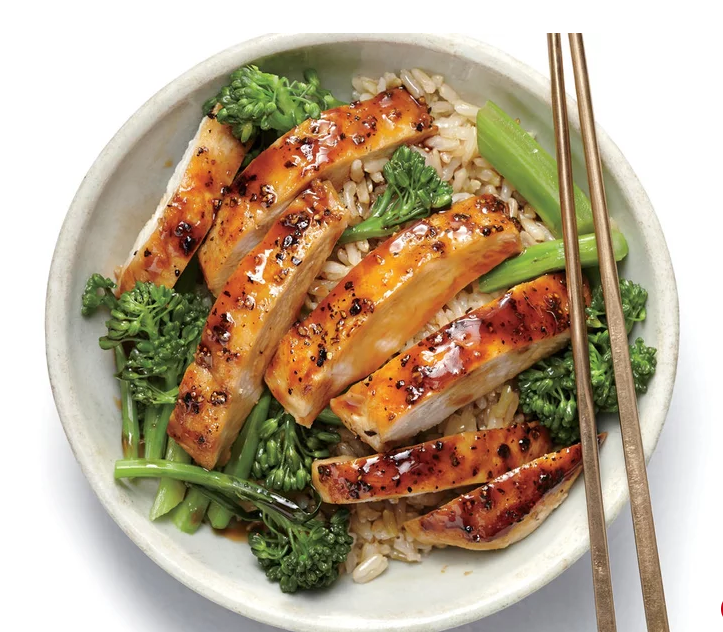 Chicken breasts are naturally tender, so marinating simply adds flavor. The over marination can break down the protein nutrition. It’s best to avoid soaking the delicate meat in acidic liquids for too long—it may become stringy and tough. To cut down on cooking time on a busy night, you can simply pound your chicken to be slightly thinner. Combine first 8 ingredients in a heavy-duty zip-top plastic bag. Add chicken to bag; seal. Marinate in refrigerator 2 hours, turning occasionally. Place a small roasting pan in oven. Preheat broiler to high. Remove chicken from bag; discard marinade. Sprinkle both sides of chicken evenly with salt. Place chicken on preheated pan coated with cooking spray. Broil in lower third of oven for 15 minutes or until done, turning after 7 minutes. These chicken fajitas get their flavor from a marinade of dark Mexican beer, soy sauce, lime juice, oil, Worcestershire sauce, and garlic. They can be prepared with a grill pan on stove, or outside over a charcoal or gas grill. A marinade plays the vital part in this recipe. Dark Mexican beer is especially great in this marinade because it turns sweet and molasses-y when cooked. Chicken doesn’t need a long marinade only an hour marination is enough before you prepare the rest of your meal. The Fun way of making Slime – DIY CRAZY LIFE HACKS!